Just before Christmas, Turtle Class had been learning about the devastating effects of deforestation in their English lessons. 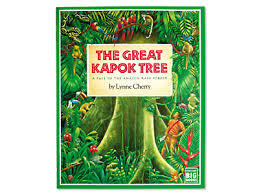 The children learnt a lot about deforestation from reading the book The Great Kapok Tree by Lynne Cherry and used the internet to research and learn about the irreversible effects it is having on our environment. Did you know 33 threes are cut down every second! We had a debate with Dolphin Class and decided to write letters to Prime Minister, Theresa May. The children expressed their concerns about deforestation and presented facts, rhetorical questions and asked if there was anything that Theresa May could do to stop deforestation in their letters. The letters were sent to Theresa May and we were all very excited to have received a response back from Downing Street. Downing Street thanked Turtle Class for sending the letters and expressing their concerns. They have passed on a copy of the children’s letters to the Department for Environment, Food and Rural Affairs. Hopefully Turtle class has helped made an impact on saving our trees.